Black-bellied Plover at Heislerville WMA. Watercolor by Ken Januski. We don't see that many Black-bellied Plovers. That is primarily because of where we live. They just don't appear in Philadelphia. Less than 100 miles away in Cape May, NJ it's another story. They're not uncommon. And the same is probably true for a number of other spots about that far away. They are an attractive bird and I always hope to get a good look at them. But in my experience, limited though it is, they tend to be the most distant shorebird when a group are congregated together, in deeper water and further back than any other species. So when we spied one from inside the car at Heislerville WMA in New Jersey last May it was even more surprising to find it so close. Perhaps the car served as a blind and we weren't noticed by the bird? I'm not really sure. But I took advantage of the situation and took numerous photos. Since we were on vacation and still hadn't reached our destination all my sketching gear was packed away. But I was able to get out the camera and take some photos. So this approximately 9x12 inch watercolor was done yesterday. I often find that after a lengthy print, even one that I end up being happy with, that I want to take a break from printmaking, especially if it was a developed or ambitious print. As with cooking and eating, exercise programs or a million other things a change is often welcome. Variety is the spice of life. I recently organized my old watercolors and it is truly shocking how bad my first ones, from about 2006, are! By comparison the watercolor above is a masterpiece. But of course my ambitions have grown over 10 years. What would have more than satisfied me 10 years ago no longer does. And yet I am happy with this. It captures the bird I think and yet also doesn't look too fussy. Watercolor is a truly wonderful medium, or at least it can be, and very rarely I feel that I'm starting to use it the way it should be used. A convoluted series of circumstances recently reminded me of my background in art, especially my artistic training. It is strictly as a 'modern' artist, in the tradition of Degas, the Impressionists, the Post-Impressionists, Picasso, Matisse, American Modernists like Stuart Davis, Abstract Expressionism, the Bay Area Expressionists like Elmer Bischoff and Richard Diebenkorn and many, many, many others. One of the more or less common themes in this tradition is the unimportance of subject matter. If there's a recognizable subject then most likely it takes away from the quality and seriousness of the art. That's not my current thought but I'd say it was pretty much the unspoken and sometimes spoken theme underlying almost my entire artistic education. And it made perfect sense to me. Art should be about self-expression and not be limited by subject matter. Of course this is a massive subject and I'm not going to pursue it. All I want to say is that it was my artistic training. When I started using insects and then birds as subjects I went against that theme and found it somewhat liberating. You can be just as expressive with subject matter as without and sometimes the limitations of subject matter can lead you to more accomplished art. Constraints lead to creativity. The total lack of constraints for most people leads to entropy and chaos. In any case I just found it interesting to think about my artistic background and my current art, where subject really is important, and yet it is always sublimated to expression itself. For me it is a good place to be. What a treat to find my way to your blog this morning and see the beautiful watercolor of a black-bellied plover. I know I say this often, but they really are one of my favorite birds. I spent several summers in Downeast Maine helping with shorebird studies and these big plovers were so visible and easy to identify! I agree with you -- this is a good one! Nice to hear from you! I wish I saw them and other shorebirds more often but they're just not as common here as they are elsewhere. 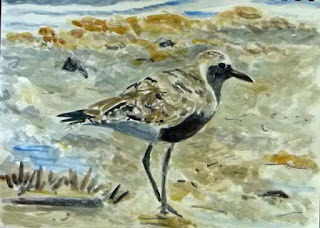 Still now is the time that shorebirds, though not the wonderful Black-bellied Plovers, appear at Heinz NWR in Philadelphia so your comment will be another impetus toward getting me to visit with my sketchbook!! Hope your garden, and everything else, is going well!